Calendula Pot Marigold Calendula Officinalis is a short-lived herbaceous perennial that is most often grown as annual. Calendula seeds can be sown directly in the spring or even summer or they can be started indoors and transplanted later. Pot Marigold is a bright, cheery plant that blooms all season long from June until frost. Calendula produces large, up to 4 inches across flowers that come in blends of yellow, orange, apricot and cream. 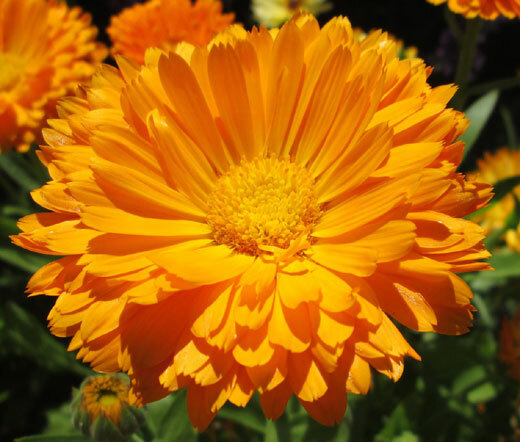 The blooming Calendula attracts various pollinators including bees, butterflies, and hummingbirds. Calendula Pot Marigold is widely popular flower for cottage, herb, and rock gardens as well as a pot and container plant. Darkness is needed to promote germination, so Calendula Officinalis seeds have to be covered lightly with soil, and Calendula likes to grow in a full sun or partial shade location with rich, moist, well drained soil provided, although the plant will adapt to most soil conditions. Calendula is one of the most known flowering medicinal and culinary herbs, and Calendula's leaves and flowers are used as flavorings and coloring for soups, salads and garnishes.